Yes Jemima the Hymer has a baby sister. Last year we sold our electric bikes to another MotorHomeFun.co.uk Funster, I hope they are enjoying them. We were not getting the use from them as there were always hills in our way just a bit too steep for the motor. And our friends Fred & Chris zoomed around on their scooter which seemed so much more practical. 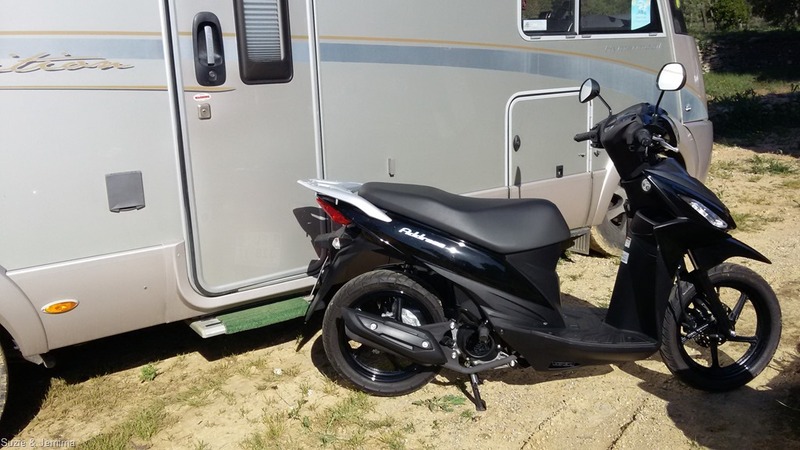 So after our 2017 winter in Portugal we set about looking for a scooter. 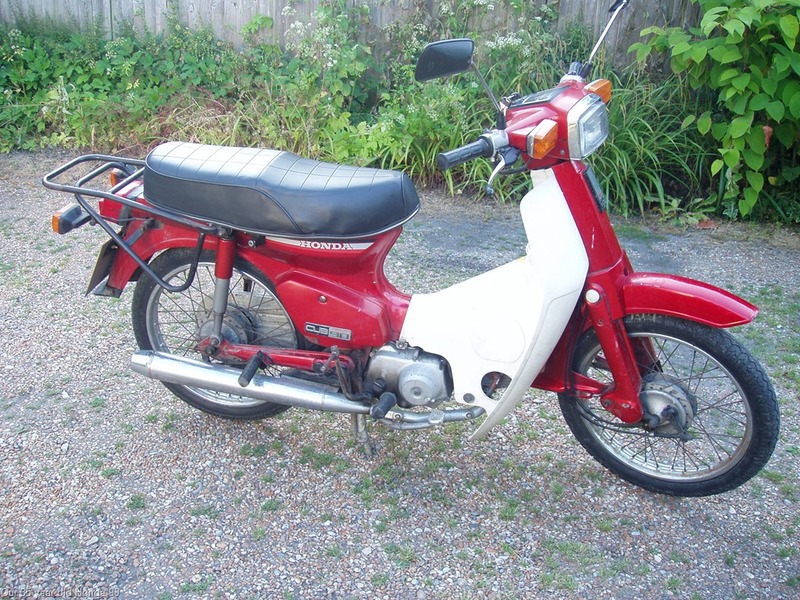 We have a 35 year old Honda 90 but our enquiries tell us that it is just too difficult to turn it French. Don’t ask! Jemima took six months and that is a modern vehicle. The Old Honda has no CofC and probably no possibility of getting one to suit the French Bureaucracy. Other friends had bought a Chinese copy of a Dax Monkey bike and were really happy with it, but many other friends said don’t buy one you will always have trouble. So we had a few months of research after our winter trip. If you read our last blog “Computer Says No” you will know that we now have really good internet at home so research was much easier and we now had the absolute luxury that we could watch YouTube videos and Steve asked question on forums like MotorHomeFun.co.uk. From the answers we got and the videos we watched we suddenly realised that however reliable or not, the Monkey Bike has no storage at all, neither for helmets or shopping so we started looking at the Honda 110 scooter. 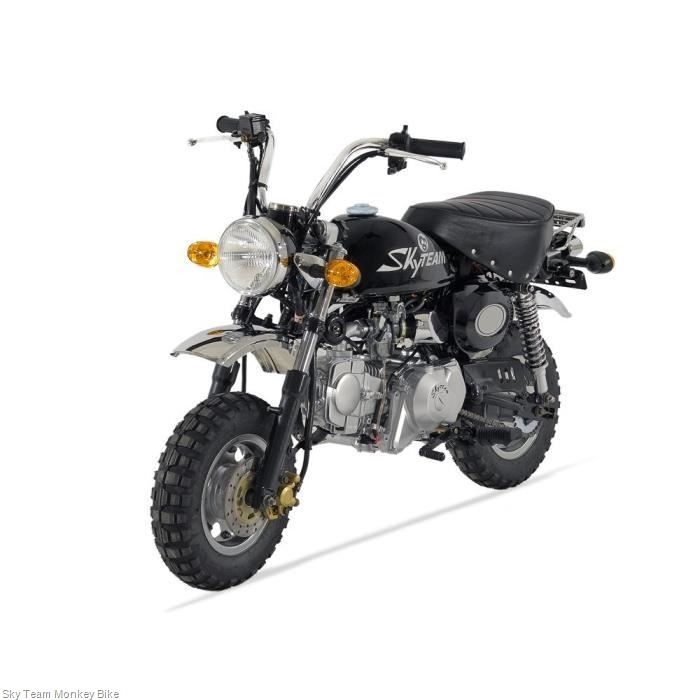 But when we looked in France they were really expensive and Steve had read that Honda had brought out a new Monkey Bike the MX125 which was really “Cool” looking, so we just had to find one to put our minds at rest. Also Jo & Craig The Bumbles who also write a Motorhome Blog had bought one and really raved about it. Well one day in April, to fix the petrol strimmer, Steve had to drive 40 minutes into Carcassonne for a one Euro piece of pipe which he very grumpily did while Judy went to her “Hobby Lobby” club. Armed with his 20 centimetre piece of silicone pipe he spotted a motorbike shop that we had never noticed before so in he went. 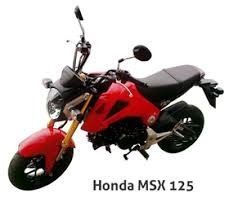 Would you believe it,they had the elusive New Honda MX125 and yes it was really, really cool like a miniature Super Bike but really expensive and totally impractical for us as it again had zero storage, even a folding toothbrush would have been too much! Also we are not large people, but the seat looked really uncomfortable. So putting his sensible head on he held on to his cheque book and walked away, then spotted a staircase down with a sign saying “d’Ocaision” which is French for Second Hand. Well, down he went and found about a hundred motorbikes and scooters of all types and there, very lonely in the corner, was a Suzuki Address 110cc which was second on our list of really good, ideal but boring scooters. 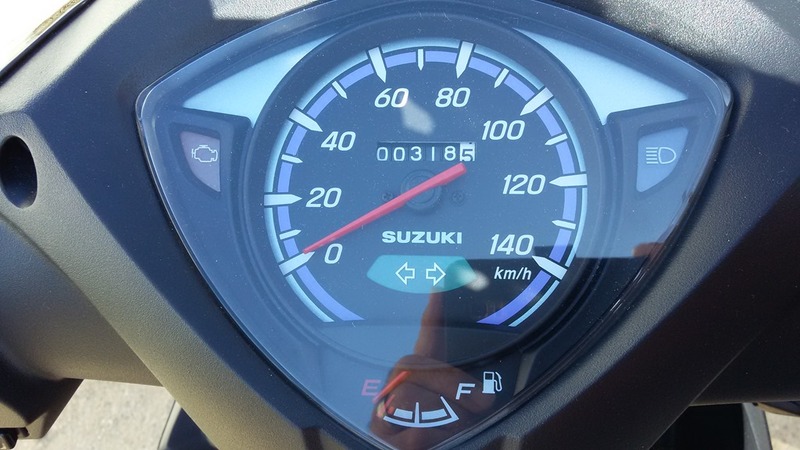 It had a sign saying “One Year Old only 814km” well somebody had read it wrong because the speedo said 314km and the price was half what we were now mentally budgeting for. It looked brand new even the little rubber flashings were still on the tyres. This picture of the speedo is when we picked it up, so they had done 4km during the service probably to ride it to their workshop. It also had a year left of it’s two year manufacturers warranty. Next day we both went back with Jemima the Hymer, the salesman brought the scooter out into the daylight and it was immaculate it even smelled all plastic and new. Steve said, we liked it but it must fit in the motorhome, do you have a ramp? 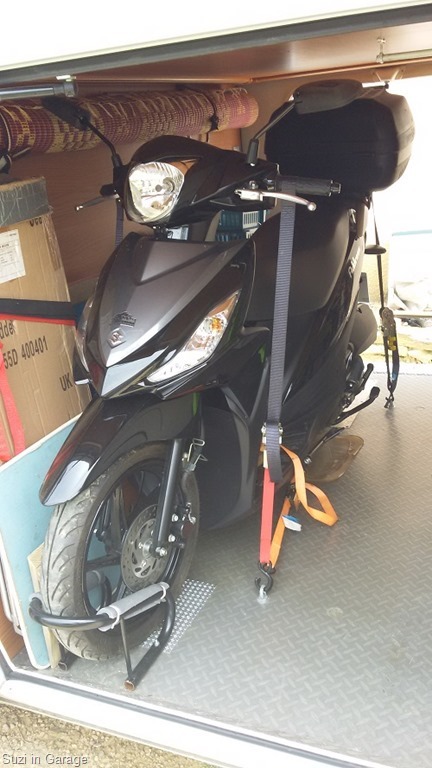 Well, quick as a flash a folding ramp appeared and the scooter was pushed up into the motorhome, didn’t even have to take the mirrors off, just twisted them flat and with a big grin the salesman said “You Sign Now?” What could we say but YES, but…. it was now midday. Oh OH, nothing comes between a Frenchman and his lunch. “You come back at 2pm and we sign the papers”. ARGH… we had this once before with a very expensive motorhome and just drove away to buy elsewhere but this little scooter is perfect. So two hours were spent walking round Brico Depot the French B&Q, looking at showers then dozing in the motor home. So by 3pm the paperwork was done and we just had to wait a week for it to have a full service and check-over before we picked it up. Of course we had to buy a super duper insurance approved lock, we had already been told that you can’t get insurance without showing a named invoice for one. Problem number one when we got it home. With the Honda 90 it was easy to get it in or out just by lifting but the Suzie was too low and just pivoted on the edge of the garage floor when we lifted the front wheel up. So a ramp was a necessity we had looked at the ones in the bike shop but they were really heavy being designed to take big 1500 cc monsters. So Steve built a ramp from a 3mt length of decking hinged in the middle. It works a treat and is very light. The next job was to go through all the clutter we usually carry in the garage of the motorhome and find a way to store it under the floor to get the weight down in the back. This took a day or two, cutting down trays to fit between the double floor and re-distributing everything to allow space for Suzie. Then Steve spent time modifying ratchet straps and Judy made sleeves to cover the ratchets so they wouldn’t scratch our new baby. So all we have to do now is sort out helmets and insurance. But Suzie is dozing in Jemima’s garage waiting for the next trip out when we can be off and away on our little scooter, SUZIE.